Lean beef brisket slowly braised in the oven with potatoes, carrots and onions. Perfect for Passover or Easter dinner. 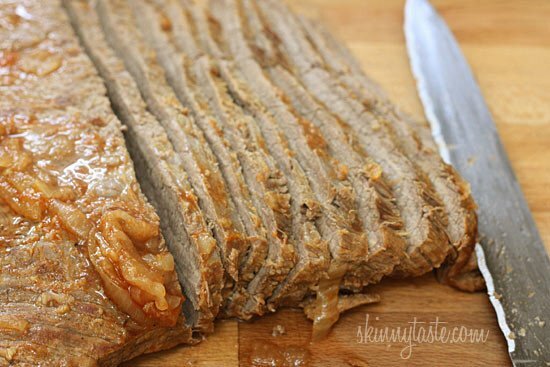 Slicing the brisket half-way through cooking assures that the meat is tender and flavorful. Other holiday dinners recipes I like to make are apricot-rum glazed spiral ham or a roasted bone leg of lamb. I made this recipe Passover friendly using ground matzo in place of flour. I simply took a matzo I had from my matzo pizza and ground it in the food processor or you could also use cake meal which they sell in the Kosher section of your supermarket. If you are not celebrating Passover you could use all purpose flour instead. For gluten free, rice flour works fine. This serves about 8 people, give or take depending on the size of your brisket after it’s trimmed or how hungry your guests are! Lightly season the brisket with salt and pepper to taste and lightly dust with cake meal. Heat the oil over medium-high heat in a large 7-quart Dutch oven or other heavy pot with a lid large enough to hold the brisket. Add the brisket to the pot and brown on both sides, about 10-12 minutes. Remove meat and set aside. Add the onions, salt and pepper to the pot and cook until soft and browned, about 10-12 minutes stirring constantly with a wooden spoon, scraping up any browned bits stuck to the bottom of the pot. Return the brisket and any accumulated juices to the pot on top of the onions. 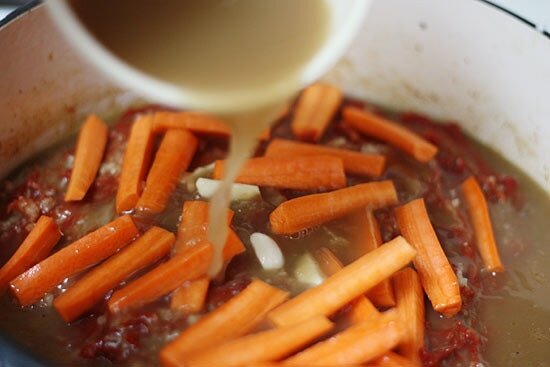 Spread the tomato paste over the brisket, sprinkle with salt and more pepper to taste, then add the garlic, beef broth and carrots to the pot. Cover the pot, transfer to the oven, and cook the brisket for about 1-1/2 hours. 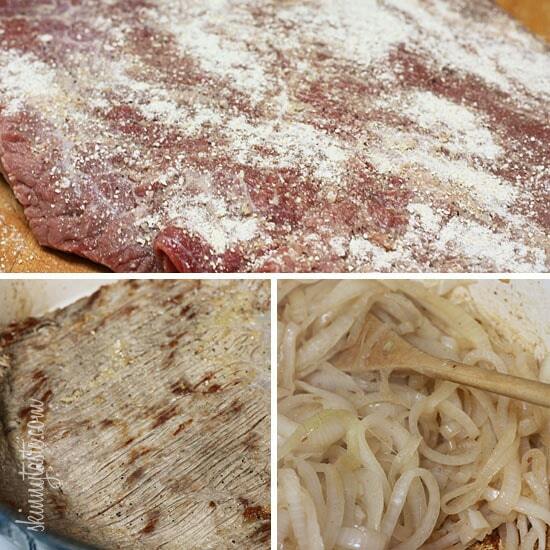 Remove the brisket and transfer to a cutting board. Using a sharp knife, slice the meat across the grain into approximately 1/8-inch-thick slices. Return the slices back to the pot, keeping the brisket together so it resembles the unsliced brisket. Add potatoes and sprinkle with a little more salt and pepper. Cover the pot and return to the oven. Reduce heat to 325°F and cook the brisket until it is fork-tender and the potatoes are cooked through, about 1 1/2 hours. Check once or twice during cooking to add more broth if needed. To serve you can arrange the meat on a platter with the carrots, onions, potatoes and some of the liquid and garnish with fresh chopped parsley. Serve the remaining gravy on the side. Made this yesterday for the Jewish holiday and it got rave reviews! I added 2 bay leaves and minced the garlic. It was sooo delicious!t Thank you, I make your recipes all the time! I’d like to try this in the Instant Pot, how long should I cook it for? I’m going even lazier with the recipe and modifying it for the crockpot. I’ll let you know how it turns out! How did yours turn out? I just prepped everything to put in the crockpot for tomorrow. We had some leftover brisket my Husband smoked and it turned out a little tuff. I’m hoping the crockpot will make it tender. My husband loves this dish! Arre the points listed already from thr new the freestyle program? I see 9 smart points but not sure if is for the new freestyle program. THANk you! Yes it has not changed on the new program. Any way to make this a crock pot recipe? I dont have a pot thats oven safe. Yes cook for 9-10 hours on low. There is a recipe in my Fast and Slow cookbook if you have it. Do you brown “each side” 10-12 minutes or just 10-12 minutes “total” for both sides? This looks delicious! Have you ever prepared this in a slow cooker? How many smart points is this recipe?? Gina, old points and points+ are given on the recipe, so I ran it through the smart points calculator, and it came to 6 smart points per serving. It’s declicious!. 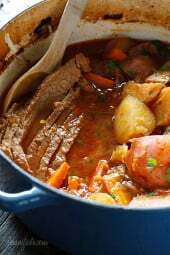 Can you sub chuck roast for like making pot roast instead ? I don’t have an oval dutch oven – just a round one. Can I layer the meat on top of each other so it all fits? Or is there another solution? I’m dying to make this! Thank you Gina!!! Hmm, don’t know how that would work? Love your recipes but, I am lost on the calories on this one, everything I see online for 4oz of brisket says it alone is 388 calories? 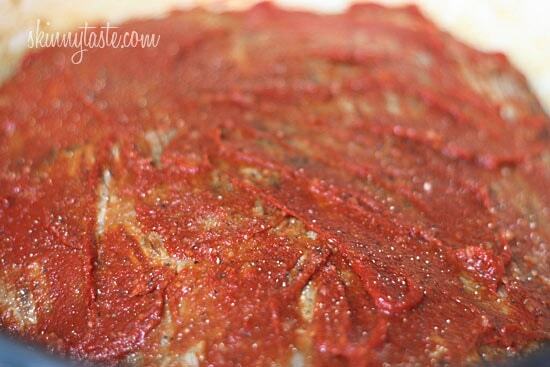 Gina – can I cook this before and freeze it, defrost and reheat or will it not keep in the freezer? Trying to prepare for the holiday! Thanks. I think that would be fine! Would sweet potatoes work instead of the red potatoes? Absolutely delish! I am now cooking this for the second time due to requests. I was unsure about the slicing and putting it back in the broth to cook part but I would never cook brisket any other way now. I planned on making this for Easter Sunday but I went out to dinner instead so I made this last night. It was so good.Great winter dish. Amazingly Delish! First time make brisket and it was so good! Thank you! How long would you cook it for if you were to cook this in a crock pot? I bought a corned beef brisket because that's all they had but it's not in a brine like the ones I buy for corned beef and cabbage. Should I still try this recipe with it? It's hard to find beef brisket. What other meat can I use instead? I guess a pot roast would work? My sister-in-law makes an amazing brisket but she refuses to share her recipe with us! This looks amazing and I love cutting it before it's completely done to give it a prettier presentation. Thanks! I am guessing that she won't share the recipe because the ingredients are embarrassing. I myself and about 10 people I know make amazing briskets and we all use ingredients like ketchup, soy sauce, coca cola, and onion soup powder. It would be embarrassing to admit to people, but that is how most people I know make it. I made this tonight – my first time cooking brisket! We absolutely loved it, and we couldn't believe how healthy this recipe really is (if you can control your portion size at least! Difficult! Ha!) The sauce is delicious, I was eating it with a spoon as I put the leftovers into a tupperware. For anyone scaling down – I used a 3 pound brisket (weighed before a pretty good amount of fat was cut off – although I did not weigh it afterwards) with 2 onions, but left the other vegetables/braising liquid basically the same. Seeing what 16oz of potatoes looked like to go along with the smaller brisket didn't seem like it would be enough in this house. I used the same cooking times (except in the browning stage) because I figured even a smaller brisket still needs time to break down those tough fibers. Turned out great! Gina, can I use corned beef brisket? It won't taste the same. oh my gosh this smells so good and it is not close to being done yet!!! Thanks Gina Keep them coming! When I put this in the recipe builder on weight watchers it would need to serve 20 people in order to be 7 points per serving? Am I doing something wrong? You have to remember that meat shrinks when it's cooked. So I calculate based on the final cooked weight since briskets will vary in size. Also be sure it's lean brisket, if you calculate with untrimmed it will be higher. This is beyond a shadow of a doubt THE BEST brisket I've ever put in my mouth! It's amazing! I have it braising in my oven right now for dinner tonight. Thanks for a phenomenal recipe! I made this recipe and it turned out great! I put it on my blog, Fancy Fork and credited you! I had to cook the vegetable components separately, because some of the guests coming over are vegetarian. I used a brown gravy mix, and put the potato/carrot medley into that and slow-cooked for a couple hours in the oven. The brisket was cooked in a separate casserole, but per the instructions. I served it with corn bread, and sides of mustard greens, yellow squash, and black-eye peas (We live in Georgia). Without the vegetarians, I would like to try it in the crockpot, too, for I've had nothing but good luck with the slow cookers. 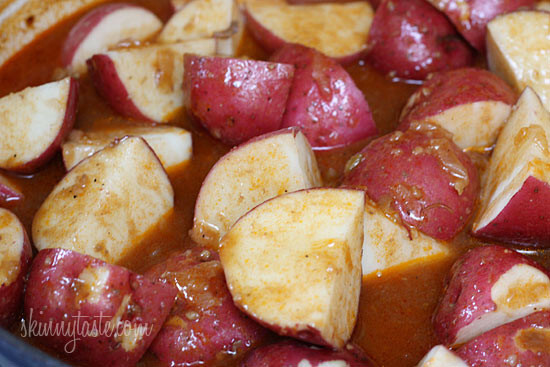 This is cooking right now in my crock pot and it smells AMAZING!!! I halved the recipe and used shallots instead of onion. The aroma is filling my house! I can't wait to eat dinner this evening! I made this tonight and everyone loved it! I changed it just a little bit, by using beef stew meat, one onion (instead of 4) and a can of tomato sauce (instead of paste). It worked out great, just enough sauce 😉 and when I figured the recipe up with these adjustments, the calorie count for 10 servings was 263 calories each, bonus! =) Thanks so much for the great recipe! I made this in a crock pot and I have been married and cooking for all of 2 months, that means it was easy!!! So I still browned the meat because I wanted to make sure it would be ready for Shabbat, which was 8 hours away. Browned it on either side, threw everything into the crock pot, put it on high until it came to a boil (about 2 hours) and then put to low for another 5 hours. The two cups of breef broth she called for was not enough to touch the meat so I added more plus some water. It was so tender!!! Amazing!!! I made this tonight and my family devoured it – even my 4 and 6 year old. The potatoes weren't to mushy and the brisket was so tender it could be cut with a fork. Thank you! Made this tonight and it was wonderful. My whole family loved it which is no easy feat to accomplish. Thank you. I love your website. Was wondering if I could leave tomato paste out? Do I need to add something in place of it? Don't like my stews tomato-y tasting — just a personal dislike. Thanks! Can't wait to try! I made this in the crockpot today. I cooked it on high for about 30 mins, then left on low for the rest of the day (about 8-9 hours). Just browned the beef and put everything else in raw. Smells beautiful and the beef is very tender. Has anyone successfully made this in the crock pot? Does everything just go in uncooked and skip the first steps? Could this be done in a slow cooker? Seems that it could, but just want to make sure. Thanks! I haven't tried it, in theory yes but not sure if will be as good. could you use a tri tip roast in stead? I made this in the crock pot. I added all ingredients and cooked for about 8 hrs on low. I only used a 2lb brisket because we are a small family. When did you cut the brisket in slices? Half way through… at the end…? I couldn't find plain brisket at my store so I bought the corned beef brisket not realizing it was so different. The flavors were amazing but the texture of the meat wasn't quite right. I have a question: you don't mention how much of the carrots are in a serving. Is that because they are 0 points? Awesome because they are soooooo good! Never cooked a brisket before! This looks AMAZING! So, I am cooking it right now! I just put it into the oven! Plan on enjoying a WONDEFRFUL supper! Thanks for all of the hard work that you put into this site! Love it! Could I use London Broil instead of brisket? I missed the sale on brisket :). I'd be interested in knowing this as well. Brisket here is very expensive. For those that made this in the crock pot — did you just throw all of the ingredients in there and let simmer during the day? So, I made it and as expected, it was AMAZING!! My husband raved about it and loved how tender the carrots and potatoes turned out to be. Thank you so much! Thanks for this recipe! I made it for Easter dinner last night along with your cheddar biscuits and both turned out AWESOME! Love this site! Just finished eating this for Easter dinner – AMAZING! Think I will use a smaller cut of brisket next time but honestly that is the only change I would make! I am always tweaking any recipe I make but I didn't add anything to this one. So delicious – thank you! And having another reason to have my enamal dutch oven is nice too! I have to say that I've made maybe 7-8 recipes off this site, and you are amazing. Everything I prepare makes me feel like a freaking pro. Not to mention that it all tastes UNBELIEVABLE. Since I live by myself, I have to cook and freeze most of it, but even thawed, it's still delicious. Keep 'em coming! 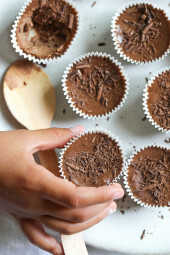 Making this in the morning for tomorrow…made me hungry reading the recipe.. Mine is in the oven now, Smells delicious! I added 1 cup of beef broth and 1 cup of red wine for our liquid. I also added 2 tsp of liquid smoke. We opted not doing the carrots but I am steaming some fresh green beans for a side. I also added two more garlic cloves to the recipe – in our family, you can never have too much garlic, ha! Happy Easter! I could only find a 2 1/2 pound brisket! Should I cut the cooking time or will it be okay? Looks wonderful! if you do in the crock pot, do you cook it on low or high and for how long? Thanks. I made this yesterday and it is DELICIOUS!!!! Will definately make it again. Yes, I make my brisket in a crock pot all the time. Put it in first thing in the morning and cook it all day! Tried this tonight! It was PERFECT!!!! Thank you for taking the time to create wonderful healthy recipes. It is really greatly appreciated. Ok well I have been cooking that little brisket for 3 hours and it is still pink. Why isn't my brisket the same color as your brisket? I have removed it from the pot with vegetables and wrapped it in foil and cooking it longer. 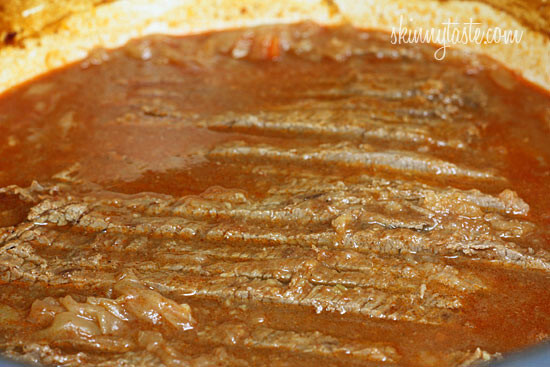 Is your brisket corned? I know that corned beef will remain pink when cooked. I love love your site! I am actually trying the brisket today, it is in the oven as I type. I really want to thank you for all your hard work I have tried several of your recipes and they have all come out great. will the cooking times change if you use a smaller cut of meat to say, half the recipe? don't have a dutch oven…. anxiously awaiting the answer about using a crock pot instead… 🙂 or can it all be done on the stove? Love this site Gina, Thank you for your hard work! Can this recipe be done in a crock pot? do you think I could swap out the brisket and beef broth for chicken and chicken broth? points values may change but do you think it would work taste-wise? 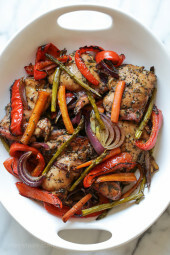 I'm wondering if there would be any way to make this recipe in the crockpot instead of the oven? This dish looks amazing!! !Love the recipe!! Any way to adapt this for the crock pot? Thank you for posting this recipe. I am making it Friday! My Italian mother-in-law lived in a Jewish neighborhood and had many Jewish friends. She made this fresh beef brisket with potatoes, carrots and onions, taught me, and this is the only cut of beef I can't ruin. The more you cook it the more tender it becomes. Her recipe was a bit different, but this is comfort food. Love your recipe. This looks delic as do all of your recipes! You are one of my new favorite food blogs! can I use a corned beef brisket if I soak it first to get rid of some of the salt? No it won't taste the same at all. Get a plain piece of meat that is not brined at all. Thanks for visiting my blog and your kind comment! Oh my gosh, your blog with all the delicious food! One could gain pounds just looking at all these delicacies featured here. 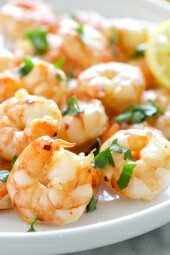 I like this recipe, might have to try it soon!! Hope you have a great Tuesday tomorrow! Hi, just found your lovely blog. What great food you make. I will enjoy your blog. It took me a good ten minutes of googling to discover that the mysterious American Brisket is the same thing as Australian Chuck steak (and not silverside like I've always thought; it turns out comes from the exact opposite end of the cow, and is pretty much only sold corned in Aus). Which is great, as it's just about the cheapest red meat you can buy. I can't wait to try this recipe! 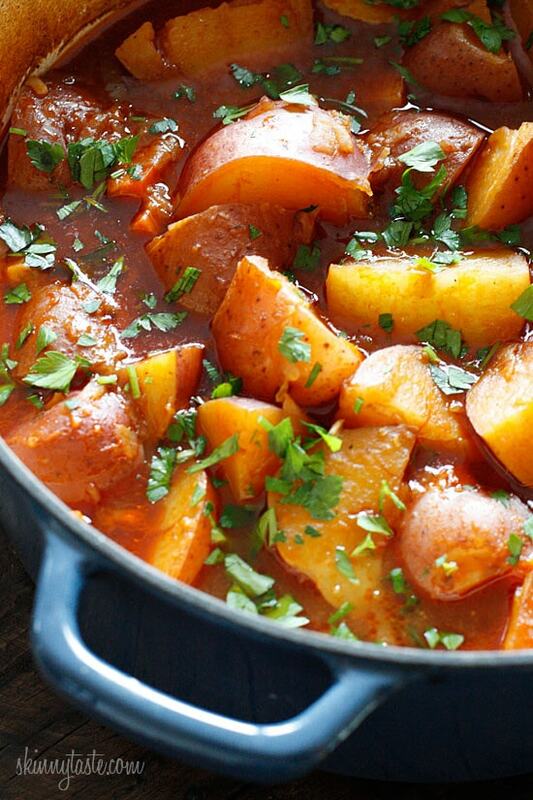 We're just heading into Autumn here and this looks like a perfect dish for the first cool nights of the year. Funny how our Spring is your Autumn. Yes, it's a cheap cut so braising is a great way to make the meat tender. Enjoy! looks so yummy! thanks for making great passover recipes, always such a hard time of the year to cook for! Can i use almond flour instead of rice flour for gluten free? Didnt know if it would make a difference. Cant wait to make this delicious dish. Tara I'm not sure how it would work with almond flour, you could always leave it out. I can practically smell it! I LOVE brisket, but I've never cooked it myself. I can't wait to try this! Thanks for all your hard work. I couldn't survive WW without your site. It's pretty easy, perfect for a lazy Sunday! Cooked this today! Everyone enjoyed it, even a friend who popped over. Thanks for all you do! The flavors burst in my mouth!